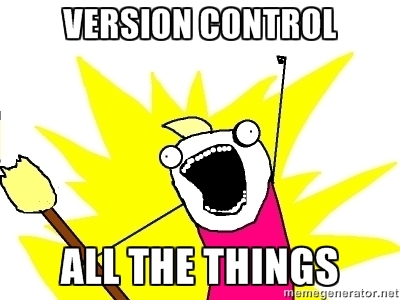 This last month I put together a presentation on version control. As far as I’m aware, everyone I work with uses some form of version control. My purpose with the presentation was many fold. I and a lot of thins that had been prrcelating that I wanted to think about and express. This as an excellent opportunity for that. One thing I know is a sore point for some developers is the idea that git is taking over. There are a lot of people espousing the idea that git is better than svn in every way. This has created a conflict culture because there are a lot of developers making good use of svn and most have heard the primary arguments in favor of git and found the arguments are not compelling enough to motivate a switch. It’s anti-agile to prescribe something like that. Each team works differently and needs to determine for themselves if the benefits outweigh the costs. Recently I read a book called continuous delivery. It is a comprehensive blowhard description of how devops “needs” to be. It covers testing strategies, and branching strategies. While a lopsided view of the world, it offered potential solutions that I have found fascinating. This offers not just a workflow that allows for potentially faster delivery, but also a realistic way to use SVN. An alternative to the branching hoopla around distributed systems. It also gave me an opportunity to talk about DevOps in a reasonably safe environment. It’s a political word at the moment and while I don’t want to get involved in that, I do want to talk about the DevOps movement. This movement is about working together. Communicating on a level that hasn’t classically been done. It’s there because a lot of the problems we face are due to the fact that in our workflow, we develop a product and throw it over a virtual wall to operations to “handle”. They don’t understand what we need done and we don’t understand what they need done. It’s a matter of sharing knowledge and searching for a deeper understanding of what we’re doing. It’s hard because we don’t want to spread ourselves thin, but in order to deliver a quality product, you have to be more than just a cog in the machine. You don’t have to know exactly “how” to do everything, but you have to have a basic understanding of “what” is happening. But I digress, I was able to tie this in to version control by talking about how DevOps is also concerned with automation. Creating scripts to do all parts of the deployments. These scripts, this automation needs to be in version control as well. They “can” be in the same repository, or they can be in a separate repository. But managing dependencies, flipping all the right switches, needs to be maintained in much the same way code is controlled. Because it is code. And of course, you can’t talk about Version Control without talking about database version control… but this one requires its own article. I’ve talked about this before, but I made a pretty picture for it recently to help explain it. SVN is a centralized repository that we use for controlling deployments, sensitive data, and storing environment specific configs. The majority of the code is contained within Git (github), the development, feature branching workflows etc. This works well because SVN is good at being central and having a linear history. Git is good at branching and going nuts with workflow. Seriously, what were they thinking. This completely invalidates the use of submodules. We want our code to be available without having to know git. That’s the whole reason they have the download a zip link. But not including all of the code means you have to unzip the code and then use git to get the submodules. Submodules are great for code reuse. But if I can’t intend my project to be downloaded by people that just want to install it and not code anything while using submodules. This is horrible. I titled this post what I wanted, but the result wasn’t quite so succinct. What I wanted was a git repository that contained a template for future applications. I have done so much what I’m considering good work with Quizmo, I wanted to create a skeleton framework that I could fork into applications. So all of the components that I’ve created could be contained in one place and when I update them in Quizmo, they would likewise be updated in the template repository, and future applications would be able to easily pull down those same changes from the template repo. So I could really live the dream of rapid development RoR has been trying to sell for the last decade. My first thought was to create a repo that had a dummy application in it and just forking it. Then I should be able to pass things back via the upstream and down with merges. It seems like such a simple operation. Unfortunately, that’s not how forking works. The problem is if you want to merge upstream, you have to merge everything. You can’t just merge the things that are in the upstream, there’s no mechanism for adding or committing one revision without committing every revision prior to that one. So the only way to have different components connected via other repositories is to have multiple submodules. Everything needs to be contained in its own directory. There’s also fake submodules*. Which just relies on a lot more setup, I haven’t encountered problems with using submodules yet, so that isn’t an issue. The most important thing with this discovery of using a mish mash of submodules is that I should modularize my code. That is to say I need to have all related components in the same place. That seems obvious, but when going with the flow of yii, I put things where yii wanted them, not necessarily where they would be best served. Like twitter bootstrap, which got just strewn about all over the app. The authentication abstraction I’m using is an IdentityFactory that chooses which xIdentity component to use which is an extension of UserIdentity but each individual xIdentity calls on its respective extension. So do the xIdentities go with the appropriate extension or with the IdentityFactory/UserIdentity? Asking the question makes me think it has to be with the extension. * Update: Upon working more with submodules, and paying attention to the pitfalls (outlined here) I’ve actually become very opposed to fake submodules (see above). Fake submodules relies on the person checking out your code to check everything out, and leaves the repository with no explicit link to the submodules. You basically just have to know. Which is fine for one guy working on one project, but is horribly irresponsible for a developer working for anyone other than themselves.